The Dart is too Tall! The apex of the dart should alway be below the apex of the chest on the body. If the dart goes too high, it looks awkward because it’s going to on the fullest part of the chest. There are rules in pattern making. The top of the sewing line on a dart is never marked. Instead, we make a drill hole (using a tool called an awl) exactly ½” below the tip of the sewing apex, the last stitch at the top of the dart line. 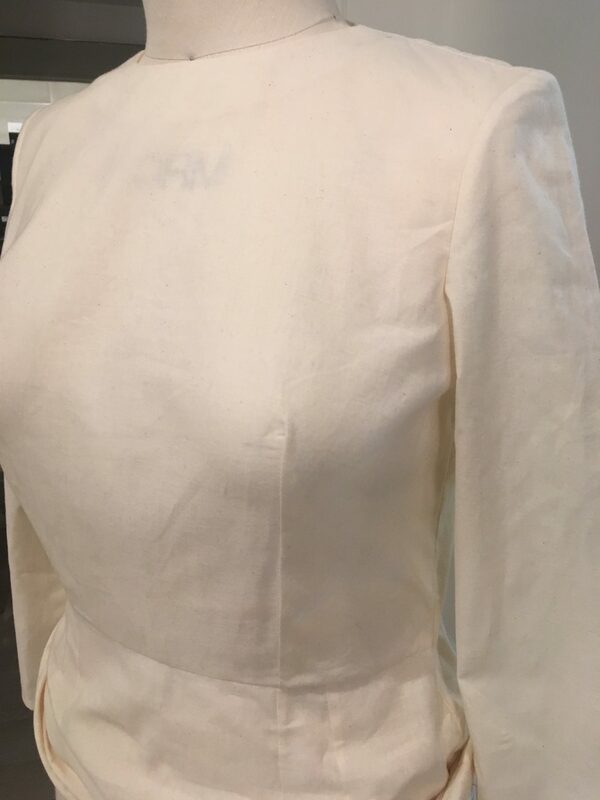 But on the muslin sample dress that came back, the dart appears to be sewn 1″ too high up. 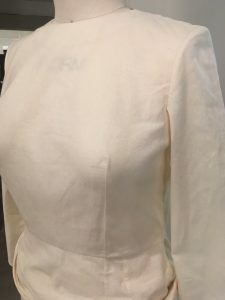 Next step, mark the sample where the top of the dart should be, pull it off the dress form and then put the paper pattern on it to figure out what needs to change.